If you ask Rodney Manko, R.N., a question, you could get your answer in English, Spanish or with a flash of his hands. He is quadrilingual, if you count the fact that he can sign in either English or Spanish. And in a pinch, he can converse in Italian or Portuguese, although he’ll be the first to tell you he has a “funny” accent and that something might be lost in translation. Manko has been with NorthBay off and on since 2004, even though he owns a home in New Orleans and travels “home” nearly every six weeks. 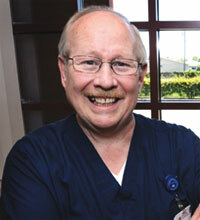 Since Hurricane Katrina wiped out a number of hospitals in the area, he’s enjoyed the steady work at NorthBay. He was one of the lucky ones. He lost only a dozen shingles off his home, which is about 20 blocks outside the French Quarter. He loves his work in the Emergency Department, because you never know what might come next. And with his special skills, he’s often called to intercede and help clarify the situation. One case he remembers was a deaf woman with a rapid heart beat. “She was trying to communicate by writing on a piece of paper, but she was stressed. Another time, he was called in for a deaf woman about to deliver a baby. “The only problem trying to communicate with her is that she’d keep closing her eyes every time she had a contraction,” he chuckles. When language is a barrier, NorthBay employs the Cyraphone, which offers an interpreter any time of the day or night, in dozens of languages.